This week, Pestforce is looking at a bird whose status as a pest has increased markedly over the past few decades. We are of course referring to the seagull. 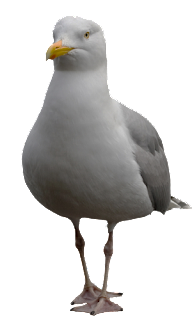 Once confined to the craggy rocks and headlands of Britain’s coasts, seagull colonies have begun to invade further and further inland, attracted by an abundance of food and urban nesting sports…to scavenge our bins, command our eaves and steal our sandwiches! However, seagulls have a darker side too. There have been several high profile incidents in the last few months where family pets have been mauled (sometimes even killed!) when seagulls have perceived these animals as infringing on the territory on which these birds have recently nested. Seagulls can be fiercely territorial, and are known to divebomb any creature they perceive as a threat to their chicks. As a result, many people are beginning to see gulls as not just a pest, but rather a dangerous threat to their pets & loved ones. However, while their menace is widely hyped in the media, do they really deserve their bad name, and is there much we can realistically do to control their numbers? Unfortunately, there are very few options actually available, as all species of gull are protected by the Wildlife and Countryside Act of 1981. What’s more, despite these birds blighting our cities, the numbers of recorded gulls in fact tell a different story…Gulls, instead, are rather in decline! The Herring Gull for instance, has declined as much as 50% since the 1970s, with their nesting sites having been reduced to only 13 sites across the UK, yet they remain a prolific pest in the eyes of many people across the UK. As with any animal, healthy numbers of gulls is undoubtedly important to the thriving of our wider ecosystem. Their status as a pest may therefore not wholly be deserved…However, at Pestforce we can’t help but think that the gull has shifted from a protected species to pilfering pest ever since their habitat has shifted from coastal to urban settings. It raises the bigger question as to whether sanctions on gull control should be relaxed in order to facilitate the migration of these birds back to their natural habitat.